Johnson Rose 3577 Offset Spatula 12-1/2"
TigerChef > Smallwares > Kitchen Utensils > Spatulas >< Icing Spatulas > Johnson Rose 3577 Offset Spatula 12-1/2"
✔ Black nylon construction✔ Heat resistant up to 410°F✔ Dimensions: 12-1/2" O.A. $33.06 FDick 8133123 Straight Blade Spatula 9"
$20.76 FDick 8133512 Offset Spatula 4-1/2"
$1.89 TigerChef Stainless Steel Icing Spatula 12"
$1.02 Winco TOS-4 Spatula 4-1/4"
$2.05 Winco TOS-9 Spatula 9-1/2"
$0.97 Winco TNS-4 Mirrored Bakery Spatula 4-1/4"
$1.65 Winco TNS-9 Bakery Spatula with Wooden Handle 9-1/2"
$11.41 FDick 8533110 Bakers Spatula 4"
$12.40 FDick 8533413 Offset Blade Spatula 5"
$11.99 FDick 8533610 Offset Blade Spatula 4"
Use the Johnson Rose 3577 Offset Spatula 12-1/2" for a wide range of tasks from frosting cake to transferring cookies to a cooling rack. This angled spatula is designed with a flat blade with rounded tips allowing it to easily glide across the sides and top of the cake when frosting. 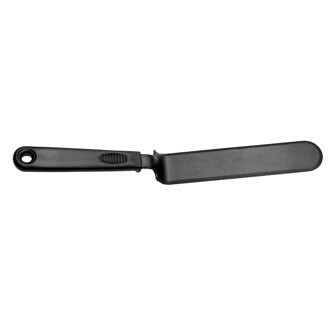 Crafted from black nylon, this offset spatula is easy to clean and will withstand heat up to 410° Fahrenheit. Thanks to its comfortable handle, this spatula provides a firm grip for easy maneuverability.